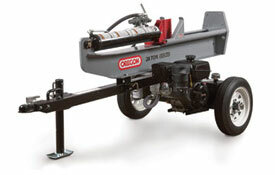 Log Splitters | ASJ Small Engines, Etc. Log Splitters are made to split cut-lengths of logs into more manageable sizes appropriate for burning in the desired stove or fireplace. There are a variety of splitters rated for varying tonnages, depending upon the size and dryness of the wood being split. Traditional horizontal log splitters require the log be lifted to the horizontal splitting surface, where vertical/horizontal splitters can be used like horizontal splitters, or split logs at ground level when used vertically. In addition to servicing virtually all of these units, ASJ sells Log Splitters from Oregon, Gravely, Echo/Bearcat and DR Equipment.